We’d love your help. Let us know what’s wrong with this preview of Five-Plant Gardens by Nancy J. Ondra. Showcase colorful blooms and striking foliage in conditions from full sun to full shade, with easy, budget-friendly garden plans and season-by-season care tips. To ask other readers questions about Five-Plant Gardens, please sign up. A great resource for anyone starting with a clean-slate area. In the 52 ways there are a variety of sun and shade options, single-colourways, rainbows, fall and winter friendly, rain gardens, salty soil, and many more - pretty much something for every space and aesthetic! The images of the plants themselves were beautifully done, but each of the 52 ways also includes an illustration of a mature garden and a planting plan - as well as a few alternative options for each plant. The description also A great resource for anyone starting with a clean-slate area. In the 52 ways there are a variety of sun and shade options, single-colourways, rainbows, fall and winter friendly, rain gardens, salty soil, and many more - pretty much something for every space and aesthetic! The images of the plants themselves were beautifully done, but each of the 52 ways also includes an illustration of a mature garden and a planting plan - as well as a few alternative options for each plant. The description also details seasonal transitions and even when to clean-up and separate plants! Written for novice gardeners, or those who are new to planning a garden, this book is an ideal introduction. It has easy-to-follow and informative instructions for both planting and garden maintenance, suitable for anyone but especially suited to beginners. The introduction explains why the five-plant idea, and that these are garden plans designed for minimal maintenance once the plants are established. The book is divided into two sections: full/partial sun and full/partial shade; each contains Written for novice gardeners, or those who are new to planning a garden, this book is an ideal introduction. It has easy-to-follow and informative instructions for both planting and garden maintenance, suitable for anyone but especially suited to beginners. The introduction explains why the five-plant idea, and that these are garden plans designed for minimal maintenance once the plants are established. The book is divided into two sections: full/partial sun and full/partial shade; each contains a variety of plans in different shapes, not just squares or borders. Each garden plan has a theme, whether color, season, or special requirement (heat-tolerance, waterlogged, sloping, borders, for fragrance, for cut flowers, surrounding the house, to attract birds/butterflies/hummingbirds or to deter deer, for coastal/salt-affected areas, for dry shade - a particular problem of mine - and many more). Each garden plan contains clear and beautiful pictures of the individual plants, and includes sun and soil requirements, zones, suggested quantities, planting instructions and alternate plants for if you're in the wrong zone, can't find the others or just want to mix it up a little. The pages are attractive and eye-catching, highlighting the plants themselves rather than the text (as it should be). Some shapes are simple, but there are more complex designs for multiple plantings while others have variants to allow for steps, pathways, benches, or decorative features. Each plan shows an overhead outline-style layout (think house plan) and also a representation of how it will look once planted (think architect's colored drawing), making it ideal for someone who can't picture the completed garden from a list, or who wants something that combines height, seasonal variation and texture to look more attractive. For each design, there is also a "Season by Season" description of how this garden will look and what work should be done, and a "Digging Deeper" section with more information, such as the best places to use this particular plan, suggestions for expanding seasonal interest by adding other plants for color or earlier/later blooming, or more detailed explanations about terms such as "deadheading" and "mulching". I wish the zone map had been at the front of the book rather than the back, as many novice planters will not know which zone they're in, but this did not prevent my thoughtful musings as to which plans I'd like to implement and in which order! I had expected some sort of encouraging conclusion, or perhaps an index of the plants included, but maybe that will be present in the final published version. This is a minor criticism, and it did not detract from my enjoyment of the pages. This is a great reference book, and I wish I'd found it before making costly mistakes on my own! definitely a book for every gardener's library! Pretty plants that come back year after year? Sign me up! But, can it really be that easy? Ondra advises to start small ("Admire large gardens but plant small ones"), shop smart (begin with 5" pots- plants will grow and spread), and get in the zone (USDA Plant Hardiness). Her enthusiastic writing is energising and everything is kept simple. The "five plants", however, refers to five types of plants -- sometimes more than one of each kind is required. The book is divided into two main parts: "Five- Pretty plants that come back year after year? Sign me up! But, can it really be that easy? - Some limitations: Plant care in the long run not addressed ("Many perennials can live for 3 to 5 years with hardly any attention..." what afterwards? ), is a "plant-by-numbers guide" doesn't teach principles of design. A very good handbook for planning flower beds. It shows diagrams for sunny, partly sunny, and shade gardens. It shows photos of each plant used. Then there is a paragraph on each plant used in that garden, with all the data about each individual plant. It also shows a colored diagram of what each garden design will look like. The only thing extra I would have wished for would be an actual photo of each whole garden. The diagrams just seem to show what a real garden with real plants will actually A very good handbook for planning flower beds. It shows diagrams for sunny, partly sunny, and shade gardens. It shows photos of each plant used. Then there is a paragraph on each plant used in that garden, with all the data about each individual plant. It also shows a colored diagram of what each garden design will look like. The only thing extra I would have wished for would be an actual photo of each whole garden. The diagrams just seem to show what a real garden with real plants will actually look like as everything grows up. This book IMMEDIATELY went into my Amazon cart after I finished it. I can't believe they only want $3 for the kindle edition (although I am getting the print version). 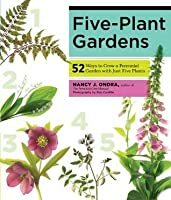 This book provided 52 garden plans for a plant garden using 5 different plants for each garden. These weren't your run of the mill plants either. They include plans for shade areas, full sun areas, the 4 seasons. It was AMAZING. I simply couldn't believe how wonderful this book was. I would say the only criticism I would have is t This book IMMEDIATELY went into my Amazon cart after I finished it. I can't believe they only want $3 for the kindle edition (although I am getting the print version). Nancy J. Ondra is a superstar in landscaping and I already have one of her books which is in my top ten. This one....not so much because I was not that impressed with the line drawings. I suspect that I needed to see the plants growing side by side for the book to really wow me. But nevertheless, some really good ideas that I may be using in the garden. Clear and SIMPLE! Tells you what to plant, how to plant it, and how to maintain the garden. MANAGEABLE! Best surprises: Use of native plants, bird seed garden, and one with plants that continue to look good through the winter even though they are DEAD! Now, how can you top that?!! :) Excellent. Well thought out and beautifully organized. I was trying to find shade happy perennials and this book was a big help. The images are wonderful. I would have liked more info on where the plants are native to. absolutely loved it. Should become a new classic in how to plan your garden. Shows ways to organize plants for shade and sun, and then divides them into colors, salty soil, slopes, anti-deer, suggestions on which colors to choose based on house color, alternate plants, etc. Wonderful! This is the best simple garden planning book I've read. Great illustrations, easy plans for any area of your yard, clear ideas for every kind of garden you can think of and all with only five plants per area. Useful, pretty, and inspiring in that five plants sounds very doable. I particularly like the design by color and sun format. I skimmed through it here and there for some ideas. I liked the different types of gardens she presented and the various plants used. Definitely will grab this when it comes time to plant again. Interesting concept, but I wasn't very excited about the plans, and I know some of these plants, and have serious doubts about them staying in the neat mounds the author illustrates. Very well laied out. A great idea generator. lots of really simple plans with suggestions for swap outs. I have a plan. I garden at Hayefield in Bucks County, Pennsylvania. Now in its 16th year, Hayefield includes about two acres of managed meadow, one acre of pasture, and one acre of intensively planted garden and open shrubbery areas. I earned a B.S. degree in Agronomy and Environmental Science from Delaware Valley College of Science and Agriculture in Doylestown, Pennsylvania, then worked as a Senior Associate Ed I garden at Hayefield in Bucks County, Pennsylvania. Now in its 16th year, Hayefield includes about two acres of managed meadow, one acre of pasture, and one acre of intensively planted garden and open shrubbery areas.